Protected for water and dirt. UV protected against sun fade. Voice coil is high temperature copper, wound on a Kapton former which allows the voice coil to handle more power while remaining light in weight. Woven fiber composite spider to stabilize the cone and voice coil in all musical situations. Longer life against harsh conditions. Protected against sun fade with UVA paint coating. Conformal coated crossover components protect against fresh and salt water spray as well as dust and sand. Limitless color choices with color on, off, strobe and programmed “light shows” possible. 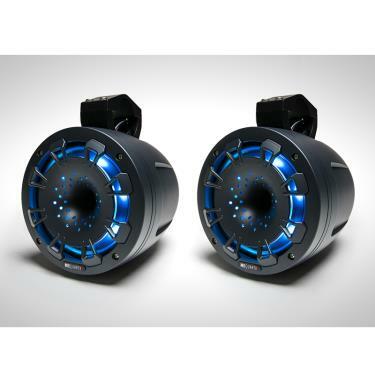 Optional N1-RC required for control of lighting systems and to sync multiple illuminated speakers. Pre-programmed demo mode included on all lighted systems.